The apartment was cute, but not perfect. Internet access was nonexistent, and I didn’t fit in the otherwise comfortable bed. The instant I opened the window, a huge mosquito breezed in. How big? It was a driving a Peugeot. (Merci. Je serai ici toute le semaine.) Over the coming days it would give me a Barton Fink-style bite on the face and a stigmata-like one on the back of my hand. Of greater concern was the fact that the street outside was desolate. But that was because I didn’t yet understand the French concept of Sundays. Dimanche is different there; you’d think I’d have tumbled to that when Rosemarie and I had gone out earlier during prime brunching hours and were the only patrons in the café. Many restaurants and supermarkets don’t open at all on Sunday, which starts out slow but finishes strong. The move forced us to scrap our initial plans. Instead we jumped on the Metro and headed out to Montmartre. We started at Sacré-Cœur. Maybe it was because the funicular railway was out of commission and we had to climb stairs to reach the cathedral, but it struck me as Donald Trump’s version of Notre Dame, a glossy edifice without a trace of the divine. The picturesque neighboring square was the only place we visited that felt like a tourist trap, thronged with bus groups and hustling street artists, and we made a hasty departure. Rewards lay further afield, like the Lapin Agile, the cabaret where Picasso was a regular, and the home Vincent Van Gogh shared with his brother Theo. As is so often the case in France, the day was redeemed by food. That evening we went to Camille, a restaurant in the Marais recommended by our friend Barry, where I had grilled beef skewers served with a ratatouille that provoked the rapture Sacré-Cœur failed to provide, as well as the finest peanuts I’ve ever sampled. Seriously. It’s like they were peanut butter already. Also on our list: seeing an English-language film with subtitles in a French theater. London Boulevard has been out in Europe for some time but seems to have fallen off the U.S. release calendar. The Departed screenwriter William Monahan’s loose adaptation of a Ken Bruen novel tells a familiar story – recently-released hard man Colin Farrell is determined to go straight – in sprawling fashion, with characters disappearing for great swaths of the movie. I still found it entertaining, thanks to Bruen’s inspired Sunset Boulevard riff and David Thewlis’ performance as the drug-addled Erich von Stroheim manqué. And of course, we were still searching for Amer Picon. Things had gotten desperate enough that Rosemarie decided to investigate a wine store, where the salesman suggested that we check ... the supermarket. It couldn’t be that simple, could it? As it happens, it couldn’t. The supermarkets we visited stocked plenty of Suze, the aperitif that was a distant second on our Zig Zag shopping list, but no Amer Picon. In my darker moments I began to suspect that French storekeepers saw us coming and spirited our spirit of choice away for a laugh. We had two days left. Were we going to pull this off? It may seem like a charmed voyage so far, with the possible exception of the andouillette incident. But no trip is perfect, kids. Long about Day Six, things took a strange turn. Saturday morning. We’re planning the day’s adventure when there’s a knock at the door. It’s the caretaker employed by the apartment’s owner accompanied by the proprietor of the store downstairs, a gent I’ll call David. David informs us that our shower is leaking into his electrical room, and he’d like us to stop using it so he can assess the damage. Half an hour later comes the verdict: he can look through a hole in his ceiling at the bottom of our bathroom tiles. If either of us uses the shower again, we could go crashing through the floor. Meaning the apartment is unsafe. But never fear. David and the apartment’s owner have already secured new digs that we can move into the next day. Without showering first. Rosemarie and I chose to find this mishap, with its prospect of imminent death, hilarious. Later we’d learn that plumbing woes are very Parisian, as is David’s resourcefulness in solving our problem. We stuck to the plan and visited the cathedral of Notre Dame, as we now had something for which to give thanks. The glorious structure had a humbling effect on this lapsed Catholic. Hunchback hunting wasn’t in the cards, as a spate of bad weather convinced us not to climb the bell tower. Instead we crossed to Île Saint-Louis for some famous Berthillon ice cream, then over the Pont Neuf to try out a spirit store that the Mullers told us about in our search for Amer Picon. (It’s amazing how I can rope other people into my silly quests.) We came up empty. All I picked up there was the news that in France, it’s called Picon Amer. I am beginning to fear for the success of the mission. Next it was back out to Bercy for a film noir triple bill. First up: The Hunted, which we saw back in February at Noir City. It remains an odd duck of a film with a disappointing ending, but on second viewing the twisted dynamic between the two leads in Steve Fisher’s script, each feeling betrayed but desperately wanting to trust the other, registered even more strongly. And lead actress Belita certainly had ... something. We had company for the next two features. I’ve raved about the work of Ray Banks here for years; Beast of Burden, the final entry in his brilliant Cal Innes series, comes out Stateside in August. Ray and his wife, the effervescent Anastasia, popped over to Paris for a pair of B-movie gems with a combined running time of less than two hours. 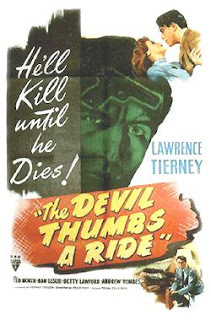 Clearly the only suitable follow-up to that hothouse confection is the lunacy of The Devil Thumbs a Ride (1947). Lawrence Tierney – who better to play the devil? – is a robber who hitches a lift from amiable lunkhead Ted North. Soon there are girls, a highly ill-advised beach house party, and bodies galore. Surprises abound in this homicidal farce with whiplash pacing. All you can do is hang on and marvel at the mayhem. Ray said he could use a bit of Tierney, and brother, did he get the full serving. Along with the Czar of Noir we headed to a nearby bar filled with what I’m going to guess was a Ukrainian football club celebrating a birthday. The ensuing conversation was far too brief; Anastasia proposed a theory about Kurt Russell that warrants an international symposium of its own, one that I will organize in the coming months. What kind of apartment do we move into? Do I ever find Amer Picon? Or Picon Amer? Tune in to the next installment. Another source of sage counsel prior to our departure was Walter Satterthwait, fellow OSS: 117 fan and author of wonderful novels like Masquerade, set in Paris of 1923. Among the many tidbits that Walter passed along was the rigorous standards applied to the preparation of andouillettes, tripe sausages that tread the fine line between delicacy and dare. Rosemarie had this information in mind on Day Four when we ventured into a restaurant serving andouillette as the lunch special and she ordered it. (“It’s in tribute to my ancestors,” said Mrs. Keenan, née LeFave.) The only person more surprised than me was our waiter, who tried to talk her out of it. “It’s made from the stomach,” he warned, complete with extravagant hand gestures. He would ultimately present the dish to her with the words, “Good luck.” As for how it tasted, Rosemarie reports that the accompanying potatoes were very good. Strong stomachs were needed for the next stop, the Paris catacombs. This subterranean ossuary holds the remains of approximately six million people transported from various cemeteries throughout the city. To move through this space – the ceiling low and dripping, mortal remains carefully stacked to maximize space and occasionally in symbolic shapes – is a profound, almost overwhelming experience. We followed our sojourn through a realm of shadows and dust with a walk through sunny Montparnasse. This in turn was broken up by our first experience with a Paris staple: the raucous protest march. We never did figure out what the hubbub was all about. We next visited the Musée Bourdelle so Rosemarie could see the exhibit on the fashion designs of Madame Grès. A grievous error regarding caffeine intake forced your correspondent to shut down for several hours, but he rallied in time for dinner followed by drinks at Le Fumoir, a cocktail bar that Eddie Muller and his fabulous wife Kathleen tipped to us. The drinks menu was simple, offering a fine whiskey sour. That night the bar was filled with groups of people dressed entirely in white, like cricket teams, involved in some activity at the nearby Louvre. We never ascertained what it was. Paris, we were learning, is about mystery. The bar served no Amer Picon, nor did we find any that day. Day Five was spent at the Louvre. Visiting the world’s most famous art museum was somewhat baffling. When did people start taking photographs of paintings? For a good length of our trip we were followed by a hangdog Italian man who stood grimly before each artwork as his wife snapped a picture, setting up the most dour slideshow in Christendom. Several people posed at the foot of El Greco’s The Crucifixion as if they were Wolf Blitzer in The Situation Room. “How do you feel about the death of Our Lord? Send us your Tweets.” The apex of ridiculousness was reached in the Mona Lisa room, with hundreds of tourists blindly snapping away and no one actually looking at La Jaconde, protected behind glass. I ended up mesmerized by the grounds of the museum and some astonishing work by Giovanni Paolo Panini. It was back to the Cinémathèque Française for more Perles Noires that evening. The Breaking Point is the lesser known but more faithful version of Ernest Hemingway’s To Have and Have Not. Eddie Muller has sung its praises for years, calling it the best adaptation of Papa’s work. But it’s been impossible to see. (Ironically, only days earlier the Warner Archive announced that they’d be making it available on DVD.) 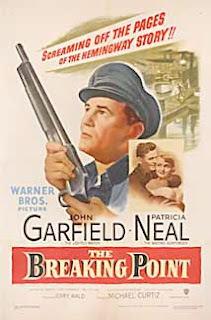 John Garfield, in easily his greatest performance, plays the fishing boat captain stretched to his limits by circumstance to learn that a man alone ain’t got no chance. Patricia Neal is the singular femme fatale who tempts him, Phyllis Thaxter the wife who keeps him grounded. The movie is devastating, ending on a note of existential dread rivaled only by Night and the City. It’s more than just the best screen Hemingway, it’s one of the great films of the 1950s. Afterward, a party of noir fans and filmmakers adjourned to Le Fumoir again. Among them was Nicolas Saada, whose entertaining thriller Espion(s) would be my in-flight entertainment on the trip home. Sitting in a Paris cocktail bar, discussing Hitchcock and Preminger with a French director who actually used the term mise-en-scène in conversation, I thought I’d died and gone to heaven. Occasionally you get lucky. Only a week after seeing Woody Allen’s beguiling bauble of a film we were winging our way to Paris to celebrate our twentieth wedding anniversary. It was the first visit to the city for both of us. Some people consult guidebooks before an excursion. Others check with a physician. Me, I ask my bartender. A few days prior to our departure I stopped by the Zig Zag Café to find out where to drink in Paris. I could last ten days without watching baseball, but no way was I going to give up cocktails. Erik advised me that Paris, like much of Europe, didn’t have an active cocktail culture, then preceded to mention several suitable bars. Next, I asked if I could bring anything back. I now had what I needed to make this vacation complete. I wasn’t just going to learn how long a man could subsist on nothing but gazpacho and Calvados. I had a quest. Day One: Transit. A long but pleasant flight, punctuated with surprisingly decent airplane food. Air France’s many entertainment options allowed me to catch up with a terrific French film not yet released in the United States. In The Night Clerk, Jean-Pierre Bacri is the manager of an upscale mountain resort forced to cover up an accidental death caused by his son. The title character, a recently paroled young convict, knows what happened but keeps schtum, leading to a bond between the two men that is destined to be tested. It’s the kind of elegant, chilling thriller that only the French can make, and it got the voyage off on the right foot. Day Three: Darkness in the City of Light. We spent the day strolling through the Marais, swinging past the Centre Pompidou and visiting the Musée Carnavelet, a town house now given over to the history of Paris. Fascinating shops abounded in the neighborhood. None carried Amer Picon. That evening we headed to the Cinémathèque Française for the start of the Perles Noires series. Our friend Eddie Muller, founder and capo of the Film Noir Foundation, had been invited to present some films, and we pushed our trip back a month to coincide with the festival. The opening night feature was the FNF-restored Cry Danger. I’ve written about the film twice before, and can only add that it plays as well in France as it did at Noir City. A late dinner with Eddie and the Cinémathèque staff followed. We’d be spending a lot of time at the theater in the days to come. One of several reasons why posting has been somewhat scarce around here lately is that I’ve gone down the rabbit hole that is L.A. Noire, the new video game from Rockstar and Team Bondi. Over at Crimespree, I offer a review. I’d be remiss if I didn’t steer you toward this piece on the game by Extra Lives author Tom Bissell at Grantland. More than a review, it’s a consideration of how L.A. Noire prefigures massive changes in storytelling. A brilliant, must-read take. Forget the Dos Equis ads. For my money the most interesting man in the world, as well as the best actor, is Argentina’s Ricardo Darín. Criminally charismatic and with a taste for dark material, he starred in the only two films directed by the late, much-missed Fabián Bielinsky as well as my favorite movie of last year. In the now-on-DVD Carancho, he’s working in the shadows again. Darín plays Sosa, a disgraced lawyer hustling for clients injured in collisions on the lethally dangerous streets of Buenos Aires. The title means “vulture,” and while we don’t actually see Sosa chasing an ambulance he does follow one very closely. He’s not above staging accidents to turn a buck. Doing so brings him into the orbit of Luján (Martina Gusmán), a hard-working doctor concealing a drug addiction. Trapped in a deeply corrupt system, they wonder if they can trust each other – and if so, whether they can make a clean break. Carancho admirably doesn’t hold the viewer’s hand, although at times I wouldn’t have minded. It’s still unclear exactly why Buenos Aires’ traffic is so deadly, or how Sosa fell to his lowly state. But the intensity of emotion between these two broken people is unmistakable, setting up a hair-raising ending. 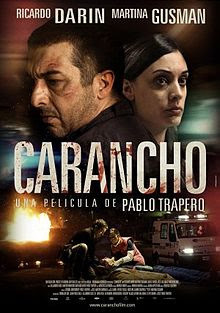 Noir to its very core and further proof of Ricardo Darín’s unassailable awesomeness, Carancho is not to be missed. AMC’s The Killing aside, Washington State seems to get short shrift in the popular imagination. But this neck of the deep woods is front, center and fully alive in this strong debut thriller from Urban Waite. Phil Hunt killed a man during a botched robbery when he was younger. Now in his 50s, he lives just south of Seattle raising horses, supplementing his meager income by bringing in the occasional load of drugs. Deputy Bobby Drake prevents the delivery of one of those shipments, and the tentative grip Hunt had on stability gives way. Soon he’s on the run, hounded by a killer in the employ of his bosses, and his only hope out of trouble is the man who put him there. Waite’s novel owes a debt to the work of Cormac McCarthy, as indicated by the ponderous title and his implacable hit man. But there’s nothing metaphorical about Grady, an assassin who enjoys his work but is no fearless killing machine. Waite creates a lovely tension between Drake, the lawman struggling to emerge from his father’s crooked shadow, and Hunt, “sure of himself in all the wrong situations. A good man, made up of all the bad things in the world.” Each man also has a spouse supportive in her own way. Muscular prose, relentless pacing, and a true sense of place make this a rock-solid thriller.